Last week my smoking’ hot wife, Kay, and I had the need to reach out for help from three different vendors. Two were excellent examples of how to help a customer and one was a dismal failure. Besides being examples of what and what not to do, these are great reminders of how quickly your relationship and your brand can be torpedoed by both slow support response, but also insincere response. 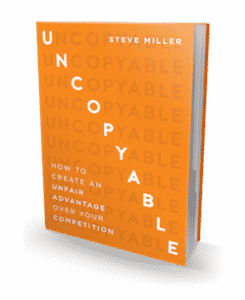 Watch this week’s Uncopyable Business episode! I am a small artisinal chocolatier in the process of relocating and building a new customer base. Would it be possible to have subtitles or a transcript to go along with your speaking? I don’t hear well even with hearing aids. When you slow down in your speech, I have no toruble understanding what you’re saying. When you speed up, which is most of the time, it becomes much more difficult for me to follow what your saying. It becomes a blur of sound. I’m very interested in hearing what you have to say. I ’m sure I’m not the only one in this predicament. Hi Linda, that’s a great request. I know Youtube has the capability and will look into it for and the others who would appreciate captioning, as well. Thanks for asking! I enjoyed last week’s “Uncopyable Business”. Please don’t refer to it as “ramblings”. I think of ramblings as being boring or confusing. But this real good stuff. PS Have any of your other “pupils” noticed how you’ve carried your corporate color to your eyeglass neck strap and frames? Love the video. There isn’t anything cute or funny about pain points our customers have. A heartfelt apology and acknowledgement of inconvenience caused is a crucial step to fixing the problem. And ya, people do notice! I appreciate you reading and commenting! I’m following up on your request, Linda, regarding closed captioning. It took a little while, because the automatic closed captioning for YouTube wasn’t working, but it’s turned on now for this video! I still need to edit, but at least it’s working. I am going back to previous videos and turning it on, as well as adding to all my future videos. I should have done this from the beginning, so I appreciate you bringing it up!